Our 13-day Legendary Rhine & Moselle* River Cruise with the top ranked UNIWORLD Boutique River Cruise Collection began in Amsterdam, the capital of The Netherlands, with a canal sightseeing cruise. 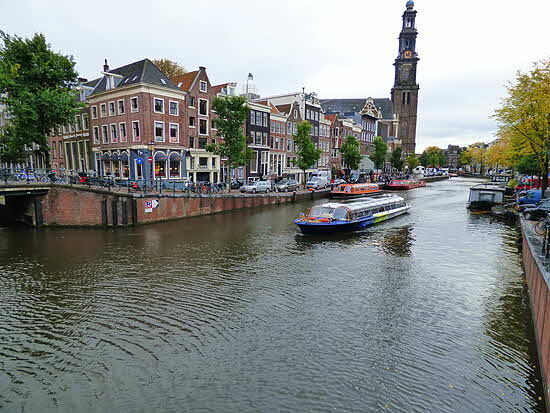 Amsterdam is surely one of the most under-rated capitals of Europe. Where else could you find canals alternating with streets and crisscrossing 90 islands that are linked by some 2,500 bridges; canals dotted with picturesque house boats and fronted by beautifully maintained 17th century merchant houses; museums of every persuasion from world-class to the absurd; and a foodie paradise, from street food to Michelin stared restaurants in one very walkable city. Our canal cruise was pure magic as the day was bright with sunshine and the play of shadows and light on the canals was intoxicating. 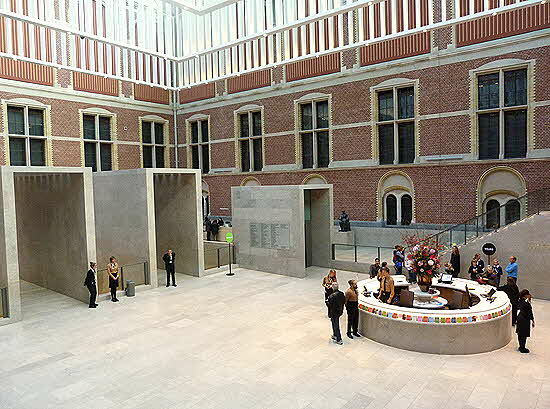 Our excursion included a guided tour of either the Rijksmuseum or the Van Gogh Museum and the UNIWORLD guests were just about evenly split on which famous institute to choose. Once back on our luxurious River Queen, we set sail for Cologne, the oldest major city of the Rhineland. Although most of the city was destroyed during WWII, some of the Old Town still exists along with 3 medieval gates and the City Hall with its Renaissance façade. 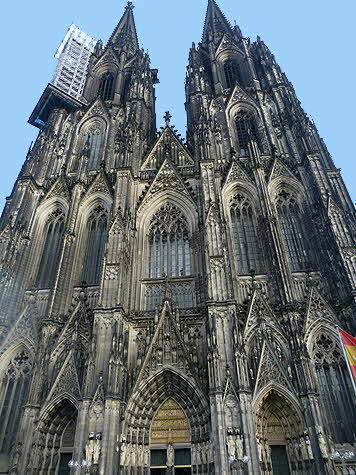 Our brightly painted tourist choo-choo train wound through the old town and ended at the renowned Cologne Cathedral. The day was gray and overcast and the faÃ§ade of the cathedral with its monumental spires seemed to blend into the gloomy sky. As if wishing makes it so, all of a sudden the sky cleared and the spires appearing to nuzzle against the deep blue sky was a sight to behold. Next to the cathedral is the Roman-Germanic Museum with the worldâ€s largest collection of ancient Roman glass vessels along with the remains of a Roman villa. Not to disturb the unearthed almost flawless Dionysus Mosaic floor, the museum was constructed around the archaeological find. 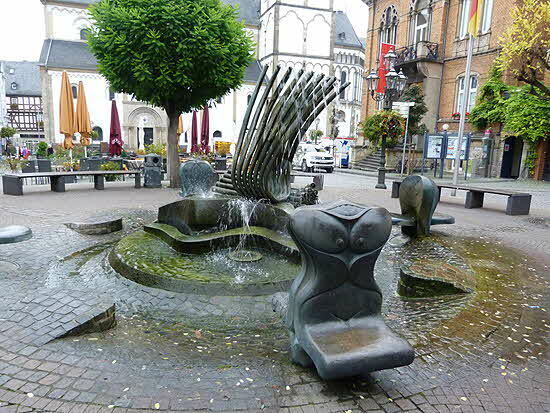 Since the Rhineland was founded by the Romans, the five countries that we touched during our cruise â€“ Netherlands, Germany, Luxembourg, France and Switzerland - have many archeological ruins that remain from that period of history. 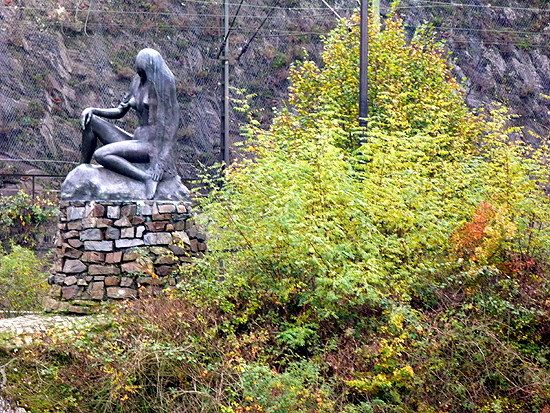 Koblenz was our next port of call and the point where the Rhine and Moselle Rivers part ways. 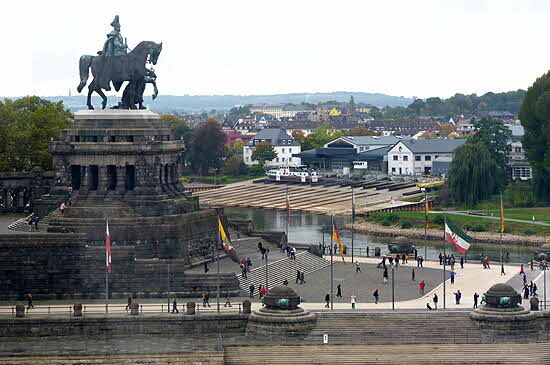 At the confluence called German Corner is a massive monument featuring an equestrian statue of Kaiser Wilhelm I who in the 19thcentury was responsible for uniting the country. Behind the statue is a semi-circular wall of plaques representing each of the nation’s provinces. Bidding farewell to Koblenz and Father Rhine we continued our cruise on Mother Moselle, as affectionately referred to by locals. The Mosel valley has picture-perfect small towns and villages fronting the river alternating with patches of vineyards with grapevines planted in military precision, climbing the hillsides like soldiers in formation. Once in a while there is a flat piece of ground that makes the labor intensive industry of viticulture less physically challenging, but on the whole farmers must ascend the steep hills to tend the vines and hand-pick the fruit. 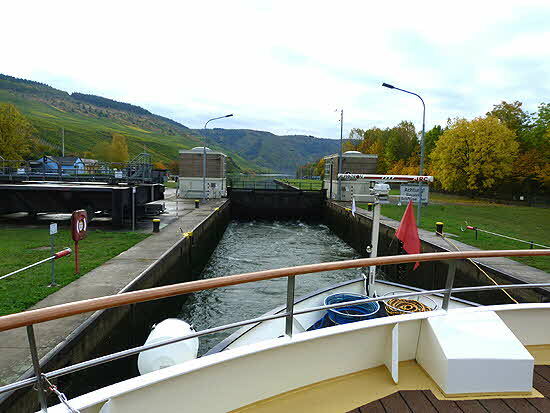 In the few days since leaving Amsterdam the autumn foliage had reached its peak phase and we were passing hillsides ablaze with colors from gold to scarlet as we maneuvered the 10 locks (could have been 12... I lost count) on the meandering river. Watching the River Queen crew squeeze the ship through the just slightly wider sides of each lock and under the low lying bridges was fascinating entertainment. Depending on the seasonal height of the river, the wheel house had a hydraulic lift mechanism that could be activated to allow passage under the bridges as we made our way down river. On the way back to rejoin the Rhine most of the locks were navigated at night and hats off to the talented crew that made the trip safely and silently. The towns we passed along the river were captivating with each laying claim to noteworthy historic, cultural or artistic excellence. Overall memorable, were the narrow cobblestone lanes and the ornate and/or humorous identification signage that dates back to a time when most people were illiterate and the only way to find the butcher, baker or candlestick-maker was by visual iconography. Even private houses were located by the visual cues of “blue door 3 buildings down from the shoemaker”€. 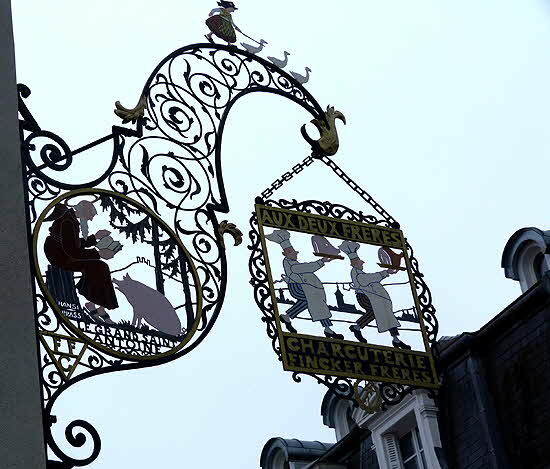 Many of these creative signs are delightful and while no longer needed to mark a destination, nevertheless add great pleasure to exploring the old towns where originals still exist in great numbers. Endlessly entertaining and mouthwatering were the ubiquitous pastry shops and the dried fruit stores with their luscious wares colorfully displayed to whet the appetite of a passersby Another titillating feature common to all the villages were public fountains that ranged from artistic, classic, humorous, modern to downright bizarre. And always providing a must-have photo-op are the half-timbered houses which graphically mark the year originally built on their façades, and if necessary after the war, the year the house was restored. Wood was a cheap but highly flammable building material and if one’s house were to catch fire the whole town could go up in flames. One way to overcome the fire hazard was to alternate wood with stone. Stone was an expensive commodity and only the wealthy could afford to entirely construct their houses with it. If you could afford to build more than one floor of your house out of stone you were considered “stone rich” which gave rise to the well-known expression. Conversely Castles were often built entirely of stone to eliminate destruction by fire and of course to make them - hopefully - impregnable. Many castles for noble families were built on the hills overlooking the river valley when money was no object -- we visited one example, the 11th century Reichsburg Castle in Cochem -- but for the townspeople it was an impossible expense, hence the half-timber houses that now stand often askew, as they have settled over the centuries. Example Spitzhäuschen in Bernkastel built in 1417. In the 16th century village of Ediger-Eller, which boasts the steepest vineyards in all of Europe, we were treated to a tour by the Mayor dressed in medieval robes, and a wine tasting at a local tavern. 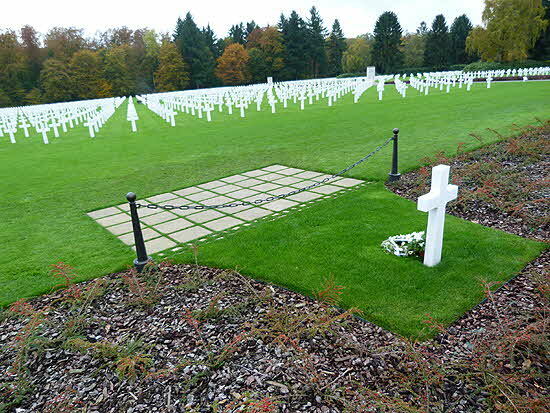 We crossed into the tiny country of Luxembourg where the trip took a patriotic turn visiting the WWII American Cemetery and Memorial where General George S. Patton still commands his Third U.S. Army. He is buried at the head of the 5,000 U.S. military personnel that gave their lives liberating Luxembourg. Back to Germany and the oldest city of Trier which in ancient times was the largest Roman settlement north of the Alps. Trier is home to St. Peter’s Cathedral which is said to entomb the Holy Tunic, the cloak that Jesus was wearing when he was captured by the Romans. The sacred relic is purported to have been donated by Emperor Constantine’s mother Helena and is housed under a magnificent sculpture depicting familiar biblical references. The cloak is hidden away, and like the Shroud of Turin, is not available for public scrutiny, a photograph is the only visual available. We are after all in Reisling country and until you have tasted the better German Rieslings you have not tasted the nectar of the Gods. This Riesling is not the sweet Blue Nun of my youth that was one step away from soda-pop; this is a sophisticated, elegant, complex, wine that pairs with gourmet indulgences. 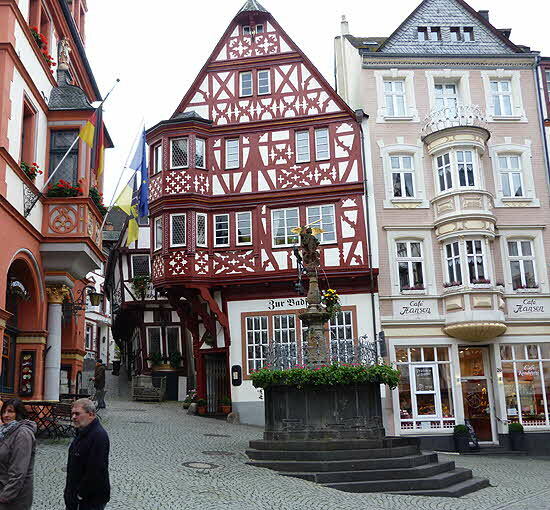 (see Dr. H. Thanisch in the Oeno File) Bernkastel is at the very heart of the most prestigious wine estates, one of which is Dr. Pauly-Bergweiler where we were invited for another wine tasting. The top-rated Bernkasteler Doctor wines come with an ancient legend that recounts that one sip of wine from this estate “brought a prince back from the brink of death”€�. 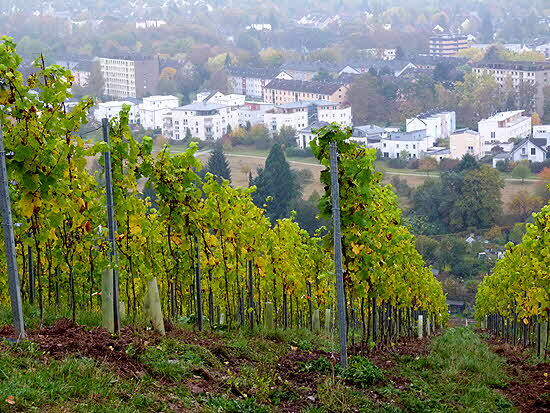 True or not, these wines are considered to be some of the best in Germany. Slate is a contributing factor to the thriving wine industry in the area which produces such extraordinary nectars. Thanks to ancient volcanic activity in the area, slate is abundant and holds warmth in the earth even in the depth of winter to nurture the vines from within. Our guide claimed that there are 100 known volcanoes in the area, all of them now extinct except for one that hiccups approximately every 2 years. Back on the River Queen, and once again linking up with the mighty Rhine, we will be sailing through the 40-mile Upper Middle Rhine Valley designated a UNESCO World Heritage Site for its castle-dotted landscape and gracious scenery. Here is where Lorelei lured sailors to their doom from her rock and you can still catch a glimpse of her as we sailed by. 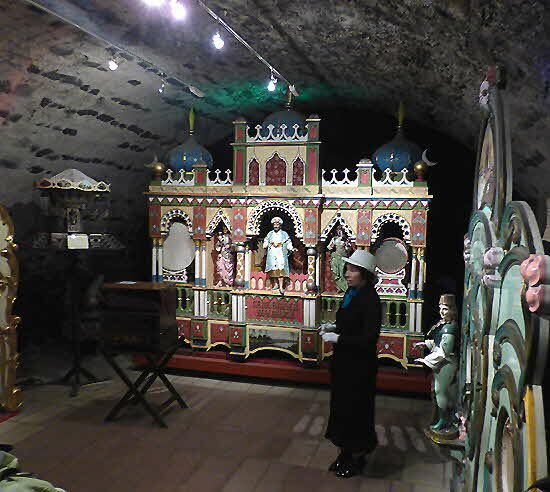 We stopped at the charming town of Boppard, and in Rüdesheim we visited the Siegfried’s Museum of Mechanical Musical Instruments and spent a delightful time exploring the 16th century mansion housing the collection. It was great fun viewing these beautifully constructed works of art, some as old as 300 years, and hearing the tinkling sounds they produced. After visiting Speyer we passed into the Alsatian towns of Strasbourg, Kaysersberg, Riquewihr, and Colmar considered by many to be the prettiest town in the world. Well superlatives aside, Colmar is indeed as pretty as they come. To brighten the dark, dull days of winter the townspeople would paint their houses in light colors and adorn them with flowers. Here you will find fanciful rows of pastel-colored half-timbered houses fronting meandering canals with their picturesque house boats. Flowers are everywhere in Colmar until replaced by Christmas decorations and then returned in the early spring to once again grace the town with their color and fragrance. I was seduced by Alsace and can easily see why this area of the Rhine has been see-sawing between France and Germany for eons. Colmar was the birthplace of Frederic Bartholdi, the sculptor of the Statue of Liberty and many of his works are scattered throughout the town. 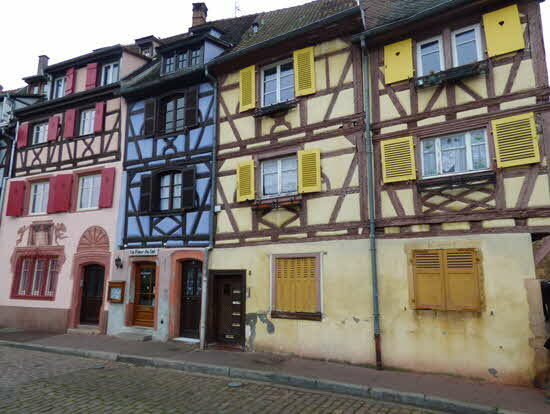 Colmar is also home to the Unterlinden Museum, originally a 13th-century Dominican convent. Its one of the most visited museums in all of France, famous for Matthias Grünewald’s masterwork the Isenheim Alterpiece. Sadly we had just under an hour to see one of the most outstanding art constructions in the world and no time at all to visit the greater museum with its collection of artifacts from prehistoric to contemporary times. This world-class museum deserves a much longer visit as does a stroll through the town. Alsace has stolen my heart not to mention my stomach, with its local cuisine and wines and I look forward to returning to this tiny corner of the world. 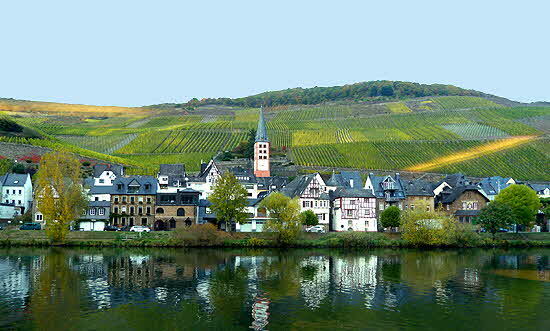 *Editor’s Note: Moselle is the French spelling and Mosel is the German spelling for the River.